Hamburger meat recipes are the most popular choice in the meat counter, it is inexpensive and can be prepared countless ways. North Americans cook more burgers than any other food. 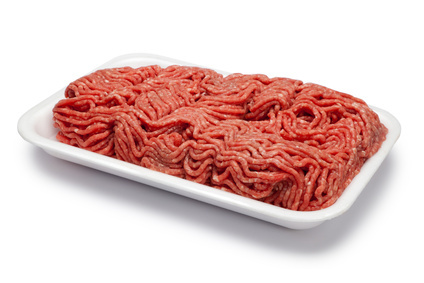 Some grocery stores label ground meat as ground chuck, ground round or ground sirloin. For those looking for lean to extra lean because of their diet or a recipe calls for extra lean, cuts from the hip (round) are the more economical choice. If you don’t mind paying more for extra lean, ground sirloin will have a better taste and flavor. Just about any part of the cow can be ground up, but the most popular for flavor and juiciness is the chuck. Because the chuck has more fat content it makes recipes for ground beef the tastiest, some recipes using ground meat include burgers, meat loaf, meatballs and taco recipes. In surveys 15-20% of fat content won in all taste tests. If your recipe or diet calls for a lean grind the chuck can be used but it must be cut from the blade eye portion of the chuck, so if you want lean and prefer the chuck flavor ask your butcher if they will grind the blade eye portion of the chuck. Medium and regular is usually made from the chuck however cuts from the hip can be used if more fat is added. Fresh beef grinds have a bright cherry-red color, the interior may be a darker purplish color or a grayish brown color, this is normal and it’s because of the lack of oxygen getting to the center. If the exterior surface is grey or brown in color then it probably should be avoided. Health officials recommend ground meat is cooked to a temperature of 160 degrees in order to assure that any bacteria or pathogens that may be present have been killed. If food safety is your concern this is sound advice then cook your meat to well done, however beef cooked to well done will be dry and chewy. Beef grinds must be refrigerated and not stored in the refrigerator longer then 2 days and up to 4 months in the freezer if properly packaged, either in tinfoil or double wrapped. Healthy Quick Meals - Spend less time in the kitchen – and eat better too, using my recipes for quick meals.